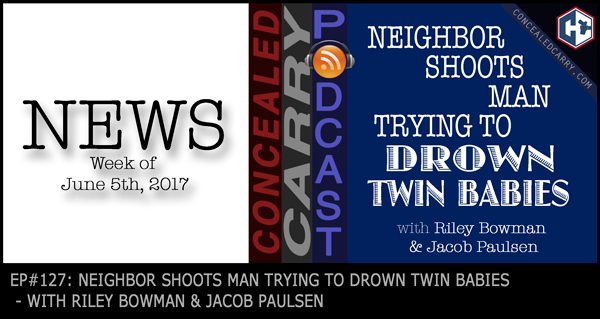 Riley and Jacob share news today about Michigan possibly becoming the next state to have constitutional carry. Meanwhile the ninth circuit court upholds a ridiculous law that forces gun owners to pay for gun confiscation and buy-back programs, and how about this…a Pennsylvania law has been proposed to make gun owners a “protected class.” How's that for interesting?! Also don't miss the JUSTIFIED story about a neighbor that heeded the call to action that saved the lives of two twin infants…and potentially the lives of an entire family! Hit the ‘PLAY' button and listen in now!! Sports Afield. After listening to these justified stories today on the podcast, have you ever considered how you would access your gun quickly in a home invasion while still keeping your firearms stored securely? The Sports Afield line of quick access handgun safes are perfect for the task. They are foam-lined yet built with heavy-duty 16 gauge steel that will keep your firearms protected and still allow you to quickly access them in an emergency with the reliable custom-programmable 4-button key pad. A line of full-size rifle safes are also now available that makes shipping and delivery easy! Trust this 100-yr-old brand (yes, the same company that has published the Sports Afield magazine since 1887) with your firearm storage and security needs. See the full line-up at: www.concealedcarry.com/sportsafield and for a limited time save 10% with a special coupon code, but you gotta listen to a past episode to get it! The permit taxation you referred to in this episode comma is not unlike the taxation on cigarettes. A portion of those taxes goes towards anti-smoking education campaigns.